Summer is here, which means cranking up the grill, enjoying frozen treats, the smell of fresh-cut green grass, and tossing together cool salads. It also means the potential of wearing a swimsuit. Sure, I’d love to comfortably strut my stuff in a two piece. But, yeah. No. I’ve been working on walking instead of driving to places closer than a mile from the house, cutting back on sweet treats, and lightening-up our favorite dishes. One of my go-to regulars for lunch is chicken salad. There’s nothing like that creamy, comforting bite of rich chicken salad sandwich full of garlic, tangy mustard, and wonderful mayo. But, OH, the calories! 1 tablespoon of regular mayonnaise has around 60 of them! Not so nice and light. So, for summer, and the hopes of dropping a few jiggly pounds, I decided to lighten-up my tasty go-to chicken salad recipe. I swapped that high-calorie mayo for plain, tangy, light yogurt. Not only was I in love, my toddler couldn’t get enough of the lightened-up summer chicken salad either. Cube your chicken and add to a medium mixing bowl. I’ve been roasting whole chickens once a week for dinner and then using the leftovers later in the week. If you don’t have any home-roasted chicken hanging out in your fridge, you can poach a nice-sized chicken breast to use for making this lightened-up chicken salad. Add the garlic, mustard, salt, and big dash of pepper to the chicken. Go ahead and chop your scallion and add along with the plain yogurt. Give things a gentile stir until all the chicken is coated. Chop and add the cucumber and cherry tomatoes along with the nice squeeze of fresh lemon. Stir again, give a taste test, and season to your liking before serving. 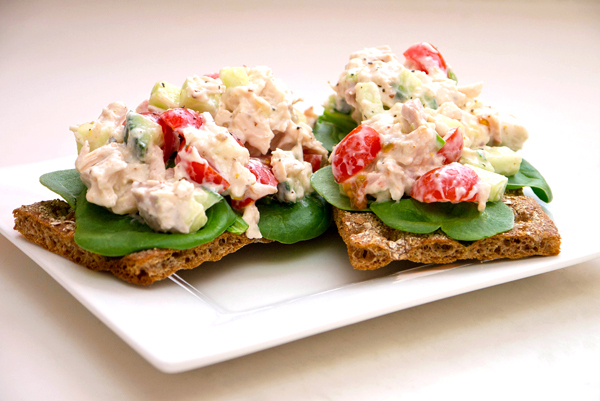 Now, you can go ahead and slather that lightened-up summer chicken salad on a few slices of whole wheat bread, but I love topping a few hearty crackers with spinach leaves and then a big scoop of the fresh salad. Hi, can we use plain greek yogurt instead of plain regular yogurt? Thanks! Greek yogurt would be delish!